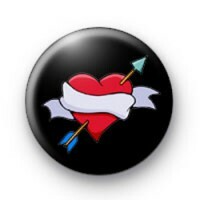 This black 25mm pin badge is of a bright red love heart with an arrow through. Could the arrow be from cupids bow or a love arrow perhaps. If you're a romantic and believe in celebrating love and all things romance then this is a lovely badge to pin to your bag or jacket on Valentines Day - or any other day in fact just to spread a little bit of love.